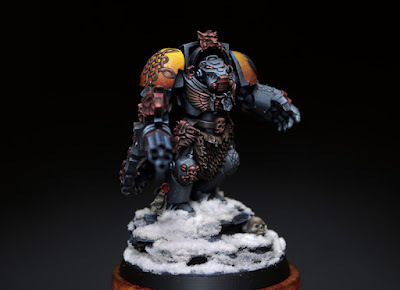 I love the colors used on this model and the way they are painted. It almost has a renaissance feel to it, although I'm sure the dark background helps. The colors go from very light and saturated to almost black, creating a very dramatic feel. The yellow on the shoulder pads particularly stand out to me. This is partly due to the color transition, which is very rich and smooth, but also because of the contrast. 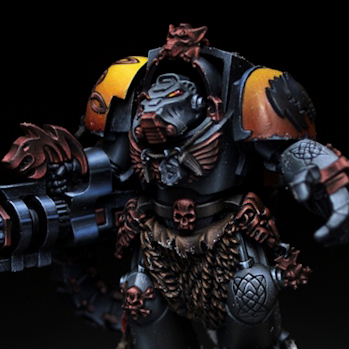 The rest of the model is very dark and subdued, making the yellow really pop. The non-metallic metals are very well done, with the silver having an almost blue steel look to it. This painter decided to go with a bronze look for the ornamentation instead of the gold you usually see to keep it a little more in line with traditional vikings. You can see even more of this historical flavor with the knot work design on his shoulder. All in all this mini is superbly done, with smooth transitions, crisp lines, and rich colors. I always like seeing a "standard" model like this with no conversion work, elevated above what we expect by a the application of a great paint job.